Fighting against white supremacy and neoliberalism takes organizing—and lots of it. One week after the election, when the world felt thick with despair, I spoke on the phone to LaDonna Allard. It was a jolt. Allard is the co-founder of the Sacred Stone Camp, on the border of the Standing Rock Sioux Tribe’s reservation in North Dakota, where water protectors have been gathered since April to block Energy Transfer’s Dakota Access pipeline. I was writing an article about how the Trump administration might bolster the pipeline and undercut the movement blossoming in her backyard. Was she worried? This was a reminder that, while the election ushered in a new political order, much of what awaits us—the attacks on civil liberties, the repression of political dissent, and the rollback of legal and regulatory protections for ordinary people against corporations—is old for communities like Standing Rock. What can we learn from their struggle? Bombarded for months with tear gas, sound cannons, rubber bullets, and water hoses (often in freezing temperatures, no less), the camp at Standing Rock grew from around 10 in April to thousands by fall. They transformed what might have otherwise been a remote, invisible, rural struggle into national headline news. The camp has been called the largest gathering of Native Americans in recent history, mobilizing many who had never before been part of a political movement, and drawing urban supporters nationwide—native and non-native—to their cause. In December, the Obama administration finally succumbed to the pressure, denying Energy Transfer the permit to drill under the Missouri River near the reservation. This had been the tribe’s main concern: The crossing threatened their water supply, and that of many others. The political landscape is about to change: The Trump administration has promised to target native reservations for their oil and gas reserves, dismantle the Environmental Protection Agency, and push through a range of new pipelines, including Keystone XL. This will undoubtedly make the work of indigenous and environmental activists more difficult. And at a time when climate scientists say that limiting global temperature increases to internationally agreed-upon levels will require keeping all remaining oil reserves in the ground, this is also a hard shove toward climate disaster. But whatever the fate of the pipeline or the movement, it would be a mistake not to count Standing Rock’s achievements as victories. In the wake of the election, liberals and leftists have been debating whether racial divisions fractured the working class and handed victory over to a racist demagogue. But I’m more interested in another question: What is there to learn, for our next four years, from a struggle rooted in native leadership and native rights, which also fought to protect the environment on behalf of all Americans? What can be gleaned from a movement that won at virtually the same moment that progressives lost? The debate about racial divisions in the election has exploded, cluster bomb–like, across the liberal Internet. The argument boils down to a simple question: How did Hillary Clinton lose the white working-class vote, and how can the Democrats win them back? One side, best exemplified by Mark Lilla in The New York Times, argues that identity politics—“calling out explicitly to African-American, Latino, LGBT and women voters at every stop”—cost the Democrats the election by alienating white working-class voters. Instead, Lilla calls for a “post-identity liberalism” that would focus on “emphasizing the issues that affect a vast majority of” Americans. At Slate, Jamelle Bouie countered Lilla’s model for a reinvigorated Democratic party with one of his own: Jesse Jackson’s 1984 and 1988 presidential campaigns. As Bouie argues, a liberalism that doesn’t “engage with the specific problems of black workers or undocumented immigrants” will always fail to speak to a majority of Americans. Jackson’s campaigns recognized the unique problems of African-Americans—and of women, white farmers, gays and lesbians, and more—but framed them in a way that made each group’s struggle an integral part of a larger one. What form has this kind of “material disadvantage” taken at Standing Rock? It’s hard to know where to begin. The reservation—remote and economically-depressed—is home to an epidemic of homelessness, suicide, unemployment, and hopelessness, with 43 percent of residents living below the poverty line. Some have claimed that North Dakota’s strict voter-ID laws discriminate against Native Americans. The reservation is also surrounded by conservative, white towns: Many tribe members perceive the state capitol, Bismarck, just an hour north from the encampment, as notoriously racist. Nationwide, Native Americans experience rates of poverty comparable to that of blacks and Hispanics—26 percent—and are more likely to be killed by police than any other group, including African Americans. What are the roots of these “disadvantages”? When I met Allard on the reservation in September, she recalled seeing her grandparents cry in the late-1950s, after the Army Corps flooded hundreds of thousands of acres of local reservation lands to build several dams. Many of the tribe’s most valuable natural resources were inundated (timber, wildlife, and fertile cropland), and entire tribal communities were forced to relocate. For Allard, this was an uncanny echo of the genocide her ancestors faced, when native lands were expropriated in service of America’s westward expansion. Now she perceives another echo in the Dakota Access pipeline. Originally meant to traverse the Missouri River north of Bismarck, city residents complained that it would threaten their municipal water supply, and the pipeline was rerouted to nearer the Standing Rock reservation in September 2014. It is significant that Bismarck is 92.4 percent white. Would the Standing Rock movement have ballooned as it did if its rhetoric had focused solely on climate change and water pollution, issues that stand to surely affect us all? At the entrance to the camp, a row of tribal flags flutter in the wind, representing the hundred-some indigenous nations whose members have passed through. 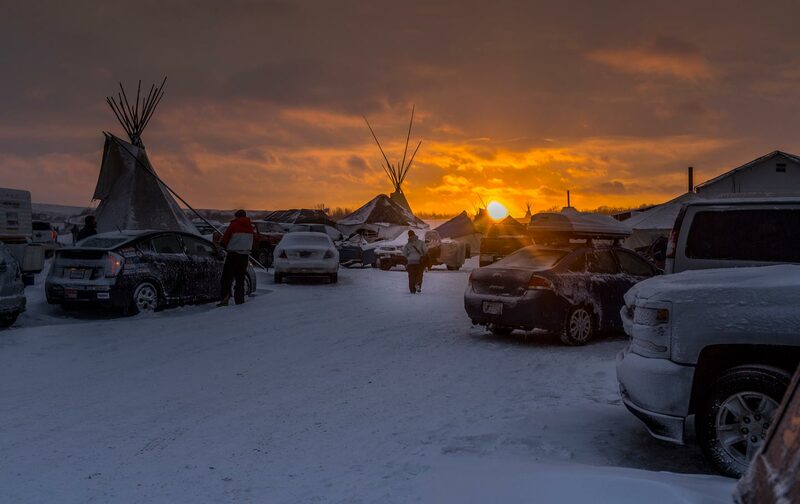 A few people I met had driven cross-country alone, first-time participants in a protest movement, and had felt compelled to join by the strongest show of native power they had ever seen. This was a diverse bunch: teachers, waitresses, lawyers, farm hands, graduate students and construction workers. They hailed from California, Maine, Florida, northern Canada, New Zealand, and Ecuador. More arrived each day. Despite the fact that Standing Rock drew its support from native and non-native alike, there is no denying that America is more racially divided than it has been in decades—and our progressive spaces are often little better. Any progressive movement looking to effectively fight through the Trump era must reckon with this reality. But this movement cannot settle for just winning back the White House for the Democrats—it needs to build a truly cross-racial working-class consciousness. Today, large nonprofits control the commanding heights of much of the progressive landscape, and the most exciting popular movements of the last few years—Black Lives Matter, Standing Rock, Occupy—have shied away from articulating a clear political program or building an organizational structure. Many other varieties of political advocacy, activism, and organization fill the spaces in between. But whatever form it takes, no coalition or movement can function without a base. And building a base today means defending marginalized communities against the forces of white supremacy and neoliberalism, while also shoring up their power so that they’re never compelled to capitulate to corporations or neoliberal solutions. This isn’t just a theoretical possibility: If the Trump administration begins targeting native reservations for their oil and gas, cash-strapped tribal governments could be tempted to sign on by the prospect of resource royalties. In this way, native power, and not just climate justice, are integral to a broad, progressive movement. Writing in Jacobin, Shuja Haider suggests one way of making this vision a reality: a “strong cord of solidarity” to connect these disparate struggles (around marriage equality, housing, climate justice or mass incarceration) in a working-class coalition of the “powerless against the powerful.” His inspiration? The original Rainbow Coalition, which the Black Panthers initiated in the spring of 1969 with members who would soon gather at that year’s United Front Against Fascism Conference in Oakland, and which pushed for a socialist economic agenda. (This is distinct from the Rainbow Coalition that Jesse Jackson popularized in the 80s.) Its members included the Puerto Rican street gang turned activist group Young Lords, Students for a Democratic Society, the American Indian Movement, and the white, working-class Young Patriots, whose members were poor Appalachian migrants in Chicago’s Uptown slum. Each organized their own communities around the specific issues they faced. Each did so through an explicitly anti-racist framework—and an economic justice framework. Any movement able to take on Trumpism, paradoxically, will need to include many of the white working-class people in America’s heartland who, in casting a vote for Trump, either supported a racist agenda or felt comfortable overlooking it. The Rainbow Coalition took on a similar task in its day, upholding a principle that originated with the Black Power movement to deal with white racism within the civil rights movement: to “organize your own people.” Essentially, white activists were asked to take their anti-racist message to poor, white communities, rather than focusing on organizing black communities. This didn’t mean that organizers of different colors didn’t collaborate. It simply meant that each group, whether the Young Lords or the Young Patriots, focused on building a “strong base in its own community and a clear program for moving members to stand up for the rights of others,” as James Tracy and Amy Sonnie write in Hillbilly Nationalists, Urban Race Rebels, and Black Power. The Young Patriots organized their fellow working-class whites and even called themselves “Hillbilly Nationalists” at the same time as they fought against racism. Much of the recent discourse on whiteness has focused on privilege and being a “good ally” within black, brown, and queer movements. There is undoubtedly value in this, and any cross-racial movement we build now must prioritize the voices of the communities most impacted by America’s racial capitalism. But there is also value—and urgency—in dismantling white supremacy among the white working class, who also stand to lose under the anti-labor, anti-environment and anti-democratic policies the Trump administration has promised. Some of this work is already happening—under the umbrella of the Showing Up for Racial Justice coalition, for instance—albeit far from the eyes of the mainstream media. This is not a vision of segregated struggles. The movement at Standing Rock thrived under native leadership, but it also drew strength from being inclusive, intersectional, and diverse. Some of the original campers at Sacred Stone were non-native environmental activists who had participated in other pipeline blockades, including at Keystone XL, while organizers with environmental nonprofits, like 350.org, quietly provided strategic and logistical support. Non-native delegations, including from Black Lives Matter, also arrived from cities to show solidarity and help out in the camp. In an especially moving episode, more than 2,000 US Army Vets arrived to form a human shield around the water protectors. They ended their trip on bended knee, apologizing to Sioux spiritual leaders. Meanwhile, in urban centers across America, solidarity actions helped to increase visibility for the tribe and target the financial institutions supporting the pipeline. Some urban activists joined caravans to Standing Rock, but many more organized events and actions in their cities, bridging the rural-urban divide that has often plagued the left. Justice and victory aren’t mutually exclusive. The problem with much of the “race vs. class” debate is that it either fixates on “winning back” the roughly 25.5 percent of Americans who voted for Trump, or supposes that a single line of rhetoric can mobilize every subset of the working class. But ignoring racial disparities won’t make them disappear. That will only happen when they are eliminated through social and political change. Whatever the limitations of grassroots struggles like Standing Rock—it is focused around a single task, for one—these are the movements that have been mobilizing masses, building a base and holding the line against white supremacy and neoliberalism. We should build on their work, and support others waging similar, invisible fights (like the White Earth Reservation’s battle against the Line 3 pipeline). We should also create space for those communities to thrive by organizing against white supremacy—and the neoliberal policies undergirding it—in the heartland of America.